Born in Kimberley, South Africa Bonolo Kavula works and lives in Cape Town, South Africa. She obtained a BA(FA) from the Michaelis School of Fine Art (University of Cape Town) majoring in Printmaking in 2014. She works predominantly in print media and incorporates video and installation in her practice using found objects to explore the concept of ‘obfuscation’: darkening and obscuring the sight of something. Kavula creates a new art persona in the video piece titled, Messy, which is featured in the Zeitz MOCAA exhibition The Main Complaint. Her name is “Black Mona Lisa”. She is a rap artist but prefers to call herself a rap visual artist because she is a painter too. The work is a music video where Black Mona Lisa makes her debut as a solo artist and rap artist. Her voice is unapologetic and brave and very candour. “Black Mona Lisa” as a character is expressing her confidence in not only her craft as an artist but also having fun while doing so. She expresses her black female sexuality with freedom knowing she is being watched and heard. Her video piece titled, You must be exhausted was a finalist in the Sasol New Signatures Art Competition (2014). She has also been part of various group exhibitions including Burr: Print and Purpose (Print Portfolio) and iQhiya Group Exhibition at AVA Gallery (Cape Town: 2016); New Monuments at Commune 1 (Cape Town: 2016); 3 881 days, blank lab and Furniture at Blank Projects (Cape Town: 2015, 2016) and the Sasol New Signatures at the Pretoria Art Museum (Pretoria: 2011). Kavula. has been awarded the 2014 Katherine Harries Print Cabinet Award at University of Cape Town (Cape Town, South Africa) and her works are part of the Works of Art Committee collection also at University of Cape Town. 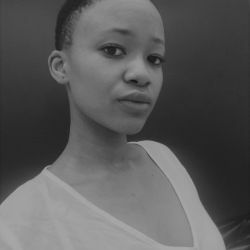 Bonolo Kavula’s work is featured in the Zeitz MOCAA exhibition, The Main Complaint (2018 – 2019).